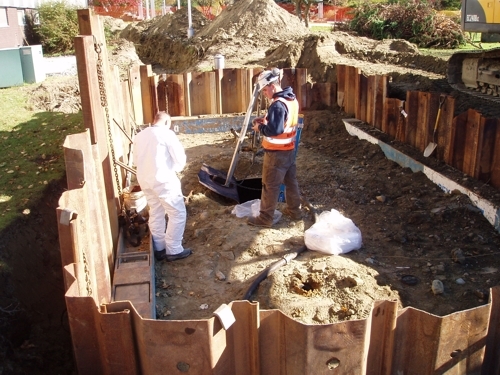 FPH Tank Installation Services sets the standard for above ground and underground tank repairs and corrosion protection. We repair and reline commercial, industrial and municipal tanks for petroleum products. Our technicians are experienced and well-trained in compliance standards and will advise you on the proper process so you’ll get maximum life from your tank. We clean fuel oil tanks of various sizes from tanks in residential settings to those in large fuel distribution facilities. Fuel tanks are cleaned for preventative maintenance and removal of built-up sludge or for decommissioning. Whether you find yourself in need of an unexpected repair or require a routine cleaning, FPH Tank Installation & Service will handle it promptly and expertly. Contact us to set up an appointment or learn more about the scope of our services. FPH Tank Installation & Service sets the standard for above ground and underground tank repairs and corrosion protection. We repair and reline commercial, industrial and municipal tanks for petroleum products. Our technicians are experienced and well trained in compliance standards and will advise you on the proper process so you’ll get maximum life from your tank.